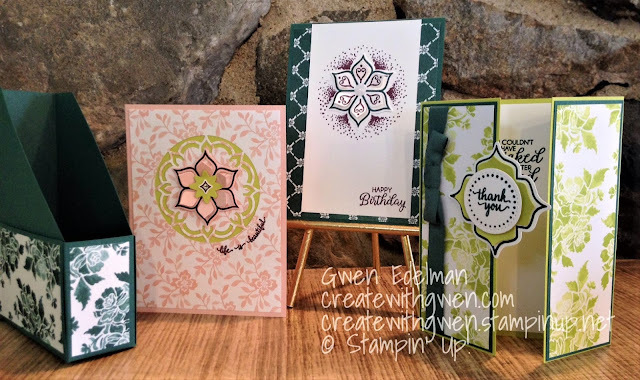 Create with Gwen: March Card Class In-the-mail! March's Card Class In-the-mail features the Eastern Beauty Photopolymer Stamp Set and Thinlits Bundle! 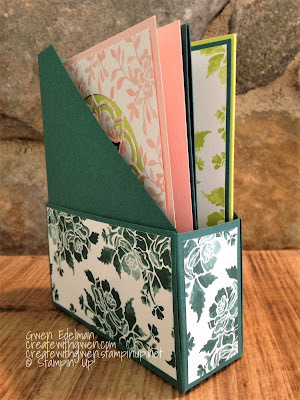 $20 - 6 Cards (w/envelopes) - 2 each of 3 designs - and a "magazine style" Card Holder. 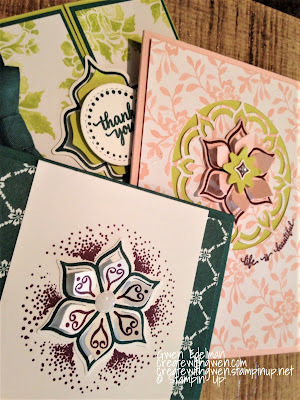 You will receive 3 finished cards - 1 each of 3 designs, and all the pieces you need: cut, scored, stamped, and ready for you to put together one more of each of the same 3 designs and the Card Holder! All packaged up and sent to you! Hurry! Your payment is your RSVP! $20 class fee by Saturday, March 24, 2018! Class will be mailed out by March 30! Don't forget: Now thru March 31, 2018, every order of at least $50 placed through my online store is entered to win the Eastern Beauty Photopolymer Bundle! Host a Stampin' Party with your friends and earn Stampin' Rewards for products! My Studio or your home! Contact me to schedule your party or for more info!